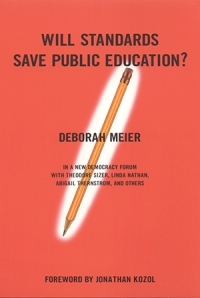 inSpirit: UUA Bookstore and Gift Shop: Will Standards Save Public Education? National leader in educational reform contests the very idea of a centralized authority that dictates how and what teachers teach. She concludes that teachers can't model creativity, thoughtfulness, accountability and engagement with schools, classrooms and communities if they are teaching to tests. Theodore Sizer, Abigail Thernstrom, Linda Nathan and others respond.